Three King’s Day, known as the Epiphany in other countries, is when the three Kings arrive into everyone’s home baring gifts for children. More so than Christmas morning, this is the typical gift giving time focusing on children. The night before toys are sold in stores late into the night and on many street corners. Balloons are set afloat from the jardin with requests from children to the Wise Men who appear and are available for photos with the children. The Three Kings, or Magi, arrived to visit the baby Jesus shortly after his birth. Gaspar (or Jasper or Casper) is an older king of India binging gold. Melchior is middle aged, giving frankincense from his native Arabia. Balthazar is shown as a young, dark skinned man with African myrrh. Families will eat rosca de reyes today, a fancy bread made with citron, cherries and figs. Buried inside are tiny baby dolls, representing the baby boys hiding from King Herod. Herod, after a visit with the three kings, tried to kill all young boys since the kings told Herod the greatest king ever was just born. Whoever gets a slice with the baby doll must provide tamales and atole (a hot drink), at a party on Candelaria, February 2. There is an ancient chapel in Colonia Allende dedicated to the three kings. However, it is now abandoned with chapel’s images being conserved by a family in Colonia Guadiana. 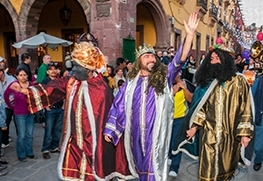 For a more indigenous celebration of the Three Kings’ Day, there is dancing and music in the small village of Agustin Gonzalez, just outside of San Miguel de Allende near the dam.